Narragansett Bay plays host to all types of sailboats over the course of the year; foiling catamarans, carbon racing yachts, stunning superyachts, and high performance dinghies, many sailing multiple times faster than the wind speed. However, once the weather gets cold and the big boats head south, there’s a different game in town. On Saturday, December 13, the Wickford Frostbiting Association hosted the Sea Dog “Worlds” (or Inter-Galactic Championships if you’d like to be politically correct) at the Wickford Yacht Club in Wickford, RI. (The ISAF approval for the Sea Dog is still pending.) 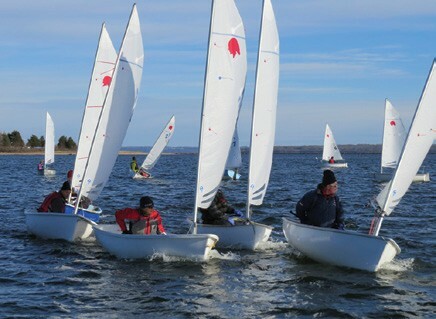 The regatta is held annually, alternating venues between the two known Sea Dog fleets in the world, at Wickford and Sachem’s Head Yacht Club in Guilford, CT.
Twenty-nine boats, including 12 that made the trip from from Sachem’s Head, were on the starting line this year, creating the largest ever pack of ‘Dogs in over 50 years of the one-design class’s existence. Wickford Harbor is a great arena for this event, and conditions were perfect for mid-December in New England: 40 degrees, bright sun, a 9- to 14-knot northwesterly and flat water. The breeze was predictably shifty and puffy, which provided many opportunities for big gains (and big losses). Throughout the day the “locals” played the left side of the course aggressively, seeking current relief. It worked. Again, and again. The “magical” left side of the course never looked particularly good from a pressure perspective and the siren’s song from the right lured the visiting sailors (and some locals, too) to that side of the course which looked great, but never paid off on the first beat. The top of the fleet was regularly dominated by Wickford sailors Gordon Fletcher, Peter Green and Brett Nazareth, with Sachem’s Headers Taylor North, Mike Schnitt and Cutter Smith trying to stay with the peloton. 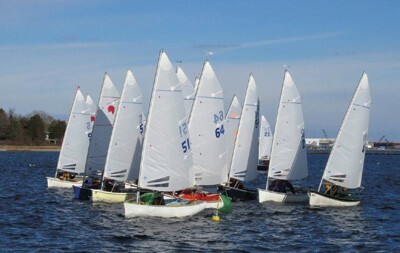 Skip Whyte dominated the first half of the regatta, winning four of the first five races. Whyte was over early in Race 6, opening the door for the only Sachem’s Head win of the regatta. Brett Nazareth won Race 7, placing him one point out of the lead behind Whyte. Nazareth finished strong in a long final race, and in dramatic fashion, clinched the championship at the finish line off the docks of the yacht club. The Wickford fleet reclaimed the team trophy for 2014. As a sponsor of the event, North Sails had Chuck Allen on the water taking photos and kindly gave away a new sail to a lucky recipient. Special thanks to WFA Commodore Nick Turcotte, Wickford Yacht Club, PRO Moose McClintock for running great races, and the WYC safety boat volunteers and party hosts. 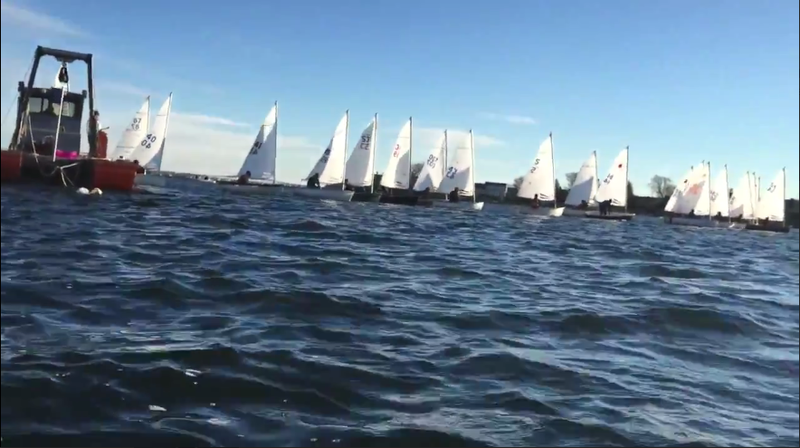 Hoping for 35 boats next year at the 2015 “Worlds” in Sachem’s Head! Great video below by Kyle Wilson. Prevention of Collision at Sea – Gee, How Does GPS Do It?